IRG Plotters & Printers, Inc. is hosting an HP Latex Open House focusing on the HP Latex 300 Series printers, and you are invited! Join us as we showcase the cutting-edge features of this 3rd Generation Latex printing system, and see the HP Latex 360 in action. Learn about the vast resources available to you when you join the Latex family, including access to hundreds of certified color profiles, useful applications such as HP WallArt, and making your print shop Green Certified. In addition, you will have a chance to submit print jobs using the latest ONYX and Caldera software RIPs. Deep discounts are available as a result of attending this Open House: You can stack discounts to obtain up to $2,500 off your Latex purchase. Onyx 12 is out! Receive discounts towards the purchase of ONYX Graphics software. This is an award-winning RIP used to run your Latex printer with ease. 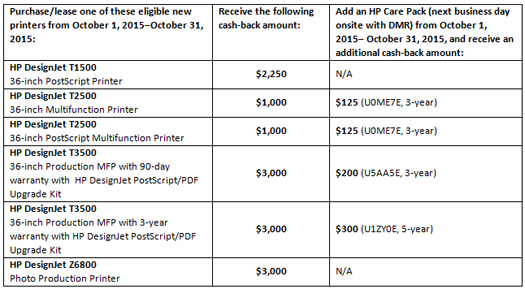 Don’t miss out on this month’s other amazing promotions for HP Graphics and HP Technical Printers. You can unsubscribe instantly here. Copyright © IRG Plotters & Printers, Inc.